For spectacular, almost touching-the-mountain views of some Himalayan giants, this is the shortest trek, and the one with the least altitude sickness concerns. The trip takes you through the heart of Gurung . 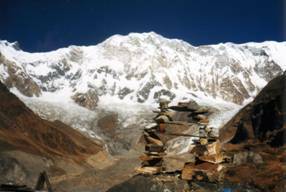 As you enter the amphitheatre that is the 'sanctuary' to reach Annapurna Base Camp (South Face), the scale and icy beauty of the mountains seems to engulf you. An added bonus is a return trip that includes a stop at a hot spring town, as well as a night and a morning at one of the best viewpoints in the <?xml:namespace prefix = st1 ns = "urn:schemas-microsoft-com:office:smarttags" />Annapurna region. 02. Free day in Kathmandu, Night at hotel. 03. Katmandu – Pokhara (bus), night at hotel. 16. Pokhara/Ktm (bus),night at hotel. ü All lodge accommodation, breakfast, salaries and insurance for guides, sherpas, sardars, porters (who will carry 12 kilos personal belongings per person) etc during lodge treks. Please note that lunch and dinner are not included in lodge trek costs.